data for politics #5: Have Women Shifted Democratic during the Trump Era? A common element of Donald Trump's rhetoric during the 2016 election and early parts of his presidency has been hostility toward women. In light of this, many believe his actions would have implications for the political behavior of women in particular, alienating them from the Republican Party and moving them further in the left-leaning direction. Some accounts have shown early signs of this phenomenon, but in other respects it remains unclear. In this post, I'll take a quick look at how political dynamics by gender are playing out in three topical areas--partisanship, general election vote choice, and midterm U.S. House race vote choice--and incorporate as much relevant data as I can to assess these possibly evolving gendered political dynamics. Tracking trends in self-described party identification is a good place to start. This variable marks a key foundation of other political behavior and one that is quite stable at the individual and aggregate levels. Clear and substantial change in this indicator will thus be notable. The below graph shows over time partisanship by gender (captured by how many more percentage points each gender is Democratic than Republican) across six major surveys. Each survey paints substantially different portraits of partisanship trends, and in this sense, the collection does not unanimously demonstrate clear gender patterns in partisan ties. Most do show small upticks in net Democratic identification among women in recent years, but the size of these changes are small and generally indistinguishable from previous year-to-year changes. Democratic movement among women in the Trump era has not been uniquely larger than in the past. Plotting the gender difference in these net Democratic values--where larger values indicate women are more net Democratic than men are--helps to better clarify the state of the gender gap specifically. The below graph visualizes this over time gap split by data source. A similarly ambiguous and inconsistent pattern across major surveys emerges once again. The gender gap increases by two points in the American National Election Studies (ANES) from 2012 to 2016, and while it increases by six points over this time span in the General Social Survey (GSS), half of that occurred by 2014 before Trump even entered the political scene. The partisanship gender gap increases by five points from 2014 to 2016 in the Pew data, but plateaus thereafter moving into 2017. For the Voter Study Group (VSG), gender gap shifts hardly appear (within the last few years) and even decline (from 2011). However, the two other data sources more strongly support a growing partisanship gender gap, and particularly upon entering the Trump presidency. In the Cooperative Congressional Election Study (CCES), the gap grows by five points from 2016 to 2017--the largest year-to-year movement in that time series. Amid wild year-to-year swings, Gallup sees its largest gender gap growth (19-point increase) moving from 2016 to 2017 over this time span. These latter data sources thus offer some support for partisan differences growing during the early part of Trump's presidency. But, again, the other four major surveys do not reflect this as much, so the evidence here is mixed. By one account, the 2016 featured the largest gender gap in general election vote choice on record. However, this analysis compared post-election vote reports in previous elections with pre-election polling averages in 2016. Now that a few post-2016 election surveys have been released, it's worth considering whether this historically large gender gap bears out in comparable survey sources. While all the survey sources here indicate the Trump era ushered in an increase in the vote gender gap, the magnitude of this change is weak in three of four cases. The most favorable evidence, found in exit poll data, shows the gender gap growing six points to a high of 24 for this century (the underlying data points to men driving this change most). The VSG, on the other hand, sees essentially no change moving from 2011 to 2016, and the ANES reveals very similar gender gaps in the last two elections with the one in 2016 being smaller than the gender gap from a few elections ago. Notably, the CCES offers likely the most reliable source for these trends as it provides information on its survey respondents’ actual vote histories through vote validation, making it possible to pinpoint actual voters. Here, the data points to little change in the gender gap over the last three elections. Changing political dynamics by gender have increasingly received attention in the context of the upcoming midterm U.S. House vote. Current polling data disaggregated by gender offers a current picture of these dynamics, which can then be compared to previous midterm vote choice data by gender. Recent generic ballot polls show a considerable gender gap, but the size of this gap depends on the mode of the survey (whether it was conducted on the internet or with a live phone interview). The below graph conveys this mode effect, plotting the "Net Democratic" measure with generic ballot data on candidate support among men (black line) and women (red) and divided by mode. In polls from the start of May through mid-July, live phone interviews have shown women to be more net Democratic and men to be less net Democratic than internet polls have shown. The modal difference has somewhat declined in more recent weeks but still remains present. That has ramifications for judging whether the 2018 midterm vote choice gender gap currently is the largest on record. The below plot shows the gender gap trajectory across three major survey sources--the ANES (dashed line), CCES (solid), and exit polls (dotted)--for years before this current one. For 2018, the average gender gap for all polls appears in red, the average for only internet polls appears in green, and the average for only live phone polls appears in blue. It's clear that the gender gap--i.e., women growing increasingly more Democratic than men doing so--has increased over time. Data points from the second half of the 20th century from the ANES has a good amount of uncertainty but still signal a rising gender gap through 1990, after which the gap--along with the one from exit polls--dips down for the next decade. CCES data, starting in 2006, shows stability in the gender gap in the past three midterm elections, diverging from a growing gap that appears in exit poll data over the same time period. Most importantly, as the points representing polling data in 2018 show, survey mode dictates whether or not the current state of the midterm election has introduced the largest midterm gender gap. The live phone average gap of 26 points would represent the largest in recorded history, while the internet average gap of 15 is high but not abnormal in the context of the last few decades. One might be tempted to fall back on a common assumption that live phone polls are of higher quality than internet polls are, and as a result provide a more reliable picture of the current midterm vote gender gap. But this outlook is likely not as well-justified anymore, as I briefly discuss here in using the 2016 general election as a gauge for survey mode quality. 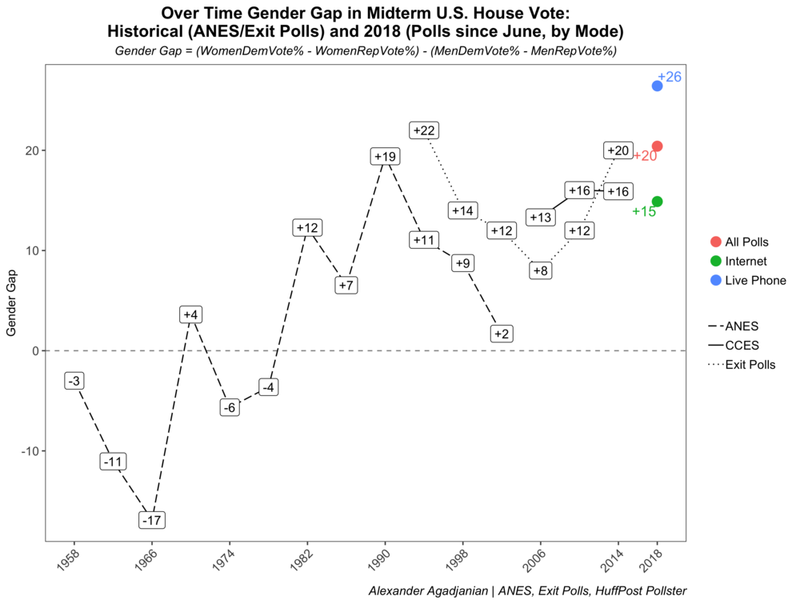 Thus, given these large mode differences, it remains unclear whether the current midterm U.S. House race features the largest historical gender gap, though it nevertheless is approaching that level. In sum, reviewing these three forms of political behavior across various data sources produces plenty of ambiguity and inconsistency in determining whether political differences between men and women are growing. This suggests claims of historically large gender gaps in the era of Trump in American politics seem a little overblown. At the same time, it's important to acknowledge the evidence pointing to some recent change. The partisanship gender gap has gradually increased over the years in a few cases (GSS, Pew) and jumped substantially one year into Trump's presidency in others (Gallup, CCES). Moreover, disaggregated data clarifies that women are driving these slightly increasing gender gaps (moving more Democratic and less Republican) more than men doing so. The general election vote choice gender gap did increase in 2016 but for the most part only barely. The upcoming midterm election offers the next compelling test of this question, but even then, current relevant evidence produces an uncertain answer. Alexander Agadjanian (@A_agadjanian) is a research associate at the MIT Election and Data Science Lab.